Nothing quite like Central Oregon for scener, especially from the top of Paulina Peak...sorry for not telling you about the drive up to the top, but its is part of the experence... Special time with your dad is what those vacations are all about. Glad two had a great time. This was a first...My Dad and I going on a week long fishing trip together, just the 2 of us! We packed up and headed out on Sunday the 10th of August, and headed to the Lapine area. On our way over we stopped at Craine Prairie and fished for several hours without a bite. Then loaded up the boat and headed to East Lake. We got there about 4 oclock in the afternoon. We set up camp and headed out on the lake. 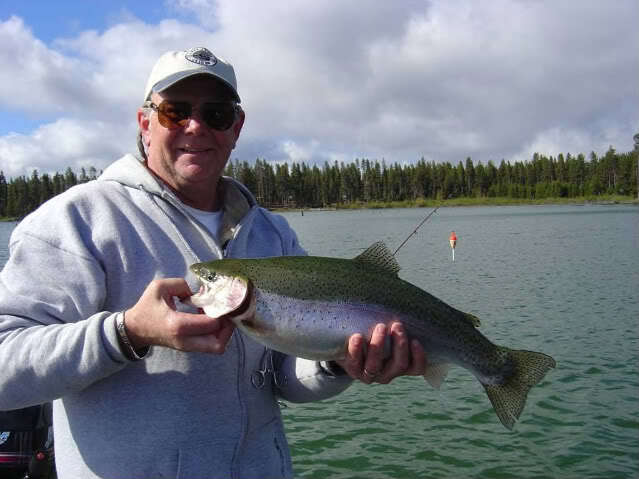 In the 1st hour I caught 2 fish, an Atlantic salmon and a rainbow, both about 13 inches, which I caught and released. After that we didn't get a bite! So we headed to camp. The next morning we got up and headed out on the lake and didn't get a bite all morning. That afternoon we hopped in my truck and went up to Paulina Peak...WOW what a cool place! We both were in awe at the veiw from up there, it was amazing!!! The road was kind of scary though, washboarded and very narrow with no guard rails. That evening we headed back out on the lake and my Dad lost 2 good sized browns. The 1st he had up to the boat and it got off, it was about 6 lbs. I would guess, about 20-22 inches with some big shoulders, we got a good look at it before it shook it's way to freedom. The other hit like a ton of bricks and jumped out of the water and was gone. Tueday morning we decided to pull up camp and go to Paulina Lake. We got down there and set up camp and headed out on the lake. After about an hour I had a fish on, but it got off before I could see it. Then we didn't get a bite until Wednesday morn when I caught a 9 inch Kokanee. So Wednesday night we loaded up the boat and headed back up to East lake to give it another try. We got on the water about 6 oclock and headed back to the area my Dad caught the Browns. We fished till dark, but it just wasn't our time...we didn't even get a bite. The fishing sucked but we had a good time anyway and are planning on going over again next year, just a couple months earlier. Sorry I didn't get a picture of any fish as I thought we'd have better luck. Oh well, maybe next time. I will post some pictures of the Lakes and sights as soon as I get the film developed! Palina lake is full of Tuey Chubs, when your stand on the shore line on the east side of the lake you can see thousands of them. I suppose those will be the next lakes to get poisoned to get rid of them. I always wondered where they came from and another fisherman told me. I guess in California they sell them for bait, and the Californians bring them up here and use them for bait, they get away and breed like rabbits. I think the state needs to put in check points, like they have in California, to stop them from bring in avasive species like that to our state. And they should check the boats from Cali. for them. They are ruining our states fisheries, and they should be fined big time when caught!!! All in all it was a trip I will never forget, I had a very good time and spent some quality time with my Dad!! !